Oversized black studded collar with his name engraved in the tag. Pokédex Entry It changes into the forms of others to surprise them. Apparently, it often transforms into a silent child. Finch would have been the child of a happy mother Zoroark and father Ninetales. When he was still eggbound, days from hatching, his parent’s den was attacked by a Druddigon. They fought to fend it off, but unfortunately both were knocked out cold. Fortunately for them, this Druddigon had no interest in eating them, but their eggs. Out of three eggs, Finch was the lucky one to be grabbed up and ran off with. The Druddigon fled before it could be stopped, but unfortunately for it there was an equally hungry Pokemon waiting to get a proper chance to strike it. It lunges, knocking the Druddigon to the ground. Finch goes flying in his egg, landing into the cold water of a river right by. In a major stroke of luck, neither of the now fighting Pokemon were able to recover him. His egg floated down the river, unknowingly guided by the water Pokemon under the surface…. The speckled egg bumps against the metal support of a Castelia pier, the Binacles infesting it now aware of it being there. They rustle, and suddenly begin lifting the egg out of the water and collectively carrying it up and gently tossing it onto the edge of the pier, next to a trash bin. The shadow of a Mienshao comes slinking up next to the garbage can, taking a small peek into the bin to see what she could find. Unsuccessful, she takes a moment to look around… and notices the egg on its side next to the can. With glimmering eyes, she picks it up and wipes off water with her paw. Without hesitation she makes her way back to the west side port, where her family lived just outside of town. A rag-tag group of Pokemon who make their living on the fly, on the streets of Castelia. Finch’s first memory was hatching in a quiet room, in the ramshackle house just outside of town, the Mienshao next to him. Keiko the Meinshao locked eyes with the little Zorua, and she immediately loved him. On the same day, he met the rest of his family. Their leader was Charlie, a cool Krokorok that has been on the street since day one, and his right hand man was Tazmer the Scrafty. Kirby the Seismitoad, he was a bit of an oaf but kindhearted, and spent a lot of time with Wheatley the Watchog who was a bit too anxious for his own good. And finally Paris, a Liepard who was her own boss but also had feelings for Charlie. Keiko was a Mienshao, and almost like a mother for the group. She came up with his name, Finch. When he was still small, they adopted a small Pidove who they called Ridley. Finch and Ridley had a pretty close relationship, as both were young kids around the same age. Eventually, they became old enough to be involved in chores. Charlie had rules for all of their situations: Take as much as you can but not more than you need, make sure NOBODY gets hurt, and never go alone. Ever since, Finch has grown up on the streets of Castelia, making his own with his family, and trying to stay out of trouble… though he kind of lusted for it. For the most part, he enjoyed his life… but somewhere inside he felt he had a greater purpose to find. That day came… when one day, Finch was caught by a young teen boy, named Kobe. Kobe adored the little Zorua, and while Finch was very hesitant at first to like the boy he soon became attached. His affection for Kobe grew exponentially; he had never thought he’d become so close to a human. Often times he would illusion himself as a kid his Kobe’s age, doing human activities with him in a world he never bothered to understand from the other side. Kobe would talk to him just like he would a sibling, and Finch quickly learned his human language. The first thing he managed to tell Kobe was his name, earning the Zorua his own collar. He grew very fond of the black leather, metal studded collar, with his name engraved on the metallic, circular tag. Finch eventually told Kobe about his old life, and his family that he hoped to see again one day. Kobe took a moment, but offered the young Zorua the chance to roam as he wanted, and visit his Pokemon family as much as he spent time with his new one. Finch happily took the offer, and Kobe felt his love and loyalty as the Zorua would skip back to him after a few days of being gone at a time. A day came where Ridley fell sick from poison. The group made a collective effort to look for an antidote, keeping him healthy with what pecha berries they could find. Before resorting to drastic measures, they attempt stealing from the local shops, ending in nothing but failure and nearly getting in trouble, as the trainers that had the effective healing items were typically those with great battling skills. Tazmer heard a rumor of a wealthy trainer leaving Castelia by plane, on one of the exclusive airports in the city. Using his developing illusion techniques, Finch sneaks onto the plane and successfully grabs a full heal from the man’s bag, and making his way to exit the plane without being noticed… but is a moment too late. The doors close, and the bustling city leaves little time for second thoughts. The plane takes off with him in it, with no one but Tazmer and Kirby knowing. In distress, Finch attempts to make an escape from the plane by any means he can. He goes to the cockpit, asking the pilot if there was any way to land to let him out. Of course, the pilot refused him in incredulity. Suddenly, there was a loud thud on the window, a streak of blood messily trailing toward the edge of the windshield. There was a petrified moment of silence… and then a loud bang hits the roof of the cockpit. Screeching and scratching of claws on the metal roof made the little Zorua loose his illusion, and he runs into the coach area of the plane. It moans against the wind, the screaming of bird pokemon never ceasing. The copilot in panic announces their inevitable crash on the over-com, and the plane breaks into hysteria. Finch, not knowing what else to do, hides in the closet in the middle of the plane, filled with parachutes and jumping gear. He curls up tightly, pulling the tag on his collar. All he felt after a half hour of panic was a deafening, disorienting thud a the plane strikes ground. The parachutes may have been his only saving grace, as the plane had only few human survivors. Trainers with well-raised pokemon managed to survive, and seek help. Finch woke up to an disaster relief volunteer opening the closet door and carrying him out. In his disorientation, he still remembers the heat and flickering of the fire as he’s transported to a Pokecenter. His recovery was fast, suffering only mild injuries. From the moment the Pokecenter would allow him to be released, he dedicated his time to trying to find a way back home. Disguising himself as a human, he tried finding ways to sneak onto boats and planes with no avail. It didn’t last more than a few attempts, as suddenly the world fell into chaos. The infection had broke out, and planes and boats stopped making trips. Security increased because of the influx of people trying to get away. Finch was stuck in Ecruteak, and his only option was to flee into the wild to find his way home on a stroke of luck. He sets off in the direction of the Lake of Rage, very unaware of which way to go home. 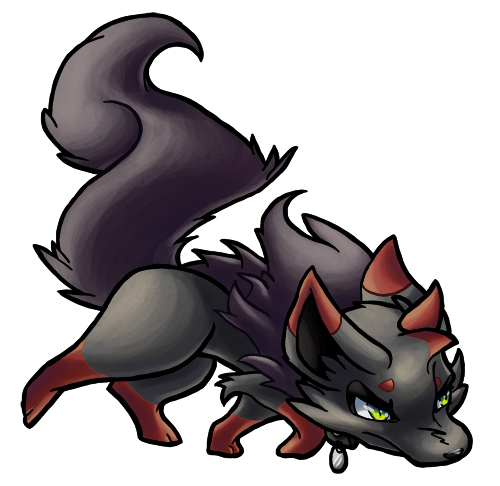 Appearance A normal, young Zorua. His eyes are peridot green and just as radiant as their gemstone likeness. Finch is a typical, impish teenager. His adopted mother Keiko taught him how to be logical and reasonable, but also how to care for himself. Well rounded, and has learned to fend for himself but has an intense group mentality, and tends to do fine on his own or with others. He's a bit of a punk, he can be mouthy but will always do things with his best intentions forward. Finch will try to act tough to scare people away, but on the inside he's a bit of a marshmallow. Really a mama's boy.